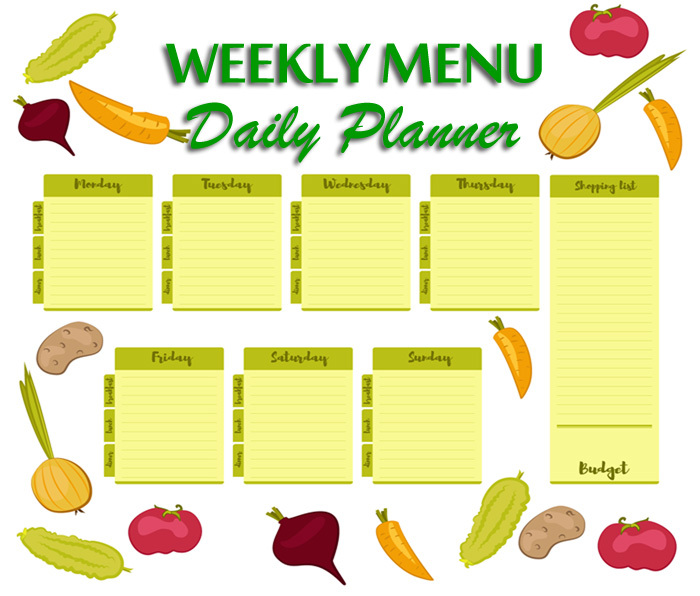 Planning healthy meals in advance is crucial whether you are changing your ways to become healthier or for weight loss. Whatever your reason, planning your meals will have a profound impact on how quickly you achieve your goals. Meal planning is the key to success. It’s easy to scoff at the idea of planning down to the smallest detail what you are going to eat day in and day out. But first take a long look at your own situation. Have you already made the decision to change your eating habits? If so, why is that? What Does Your Current Meal Plan Look Like? Do you need to improve your general health? Have you developed a chronic disease over the years? Did you suddenly discover that you are overweight? If so, I’m willing to bet you didn’t “plan” on any of these circumstances. In fact, I’m willing to bet you never planned any meal… well maybe you plan what food you will serve at your dinner parties. And that’s my point. You plan down to the last detail what you will serve your guests. Unfortunately you don’t apply meal planning to yourself on a daily basis. Or, perhaps, you do have a meal plan and it looks something like this. Wow! This is an expensive plan heading straight to catastrophic illness. This is about a $150/week meal plan, and that’s a conservative estimate. It’s also a plan of convenience. Now here you are. How is this plan working out for you? I sure hope nobody really eats this way. 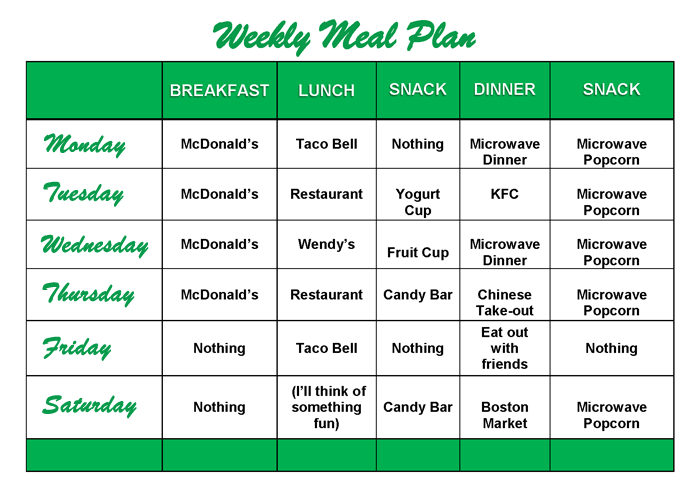 Oh, wait… I had a meal plan that looked much like this one for many years. Now I’m paying the price for this plan of convenience. People plan just about everything in their lives. They plan for a career, they plan their social events, they plan when their children will play with their friends. I could go on and on. Yet people rarely make a plan for good health; at least not until they have to. Your health is important so let’s talk about a few benefits of planning healthy meals. Health professionals agree that meal planning will improve the overall wellness of you and the members of your household. When you sit down to plan your meals you take the time to think about what you will be eating. This process alone will help you cut down on the number of calories you consume. You are also less likely to pick up fast food on your way home from work. You know you already have everything you need for a healthy dinner. When you go grocery shopping, take a list of what you need with you. This will reduce the number of items you buy on impulse. If it’s not on your list, you don’t buy it. When you plan your meals, you know you are eating healthy meals. You don’t have to guess what’s in the cans or pre-packaged foods. Meal planning is important for those dealing with type 2 diabetes. It provides them the time to analyze the amount of carbohydrates they will be consuming at each meal. If you have to change your ways due to diabetes, meal planning will be a huge help. It will make it a lot easier to stick to the required dietary changes in your life. Meal planning saves time in the long run. You’ll know what you need so you won’t waste time in the grocery store. Nor will you regularly stop and shop on your way home from work. It may take a bit longer to plan your meals when you first start, but it becomes faster over time. When you have a meal plan and shop accordingly, you won’t be frantically searching the fridge and cupboards deciding what you’re going to eat. Another timesaver is cooking in bulk or batches. At the very least, you’ll save time if you cook or prep some parts of your meals for the week in advance. For example, you can wash and refrigerate the goodies you plan you use for a salad. Then, when you’re ready to eat a salad, whether at home or to take to work, everything is ready. You just add your favorite dressing. Additionally, if you plan to eat homemade soup, you can cook up a batch in advance, as well. It will keep in the refrigerator until you are ready to heat and eat. When you plan your meals, you’re doing so to eat healthier foods. It is also less likely food will go to waste. A big part of the process is making a shopping list for what you need and sticking to it. That means you buy only what you intend to eat and buying enough to get you through the week. This is how you reduce waste; don’t buy more than you need for a specific time period. This is especially true when it comes to produce. It’s easy to over-estimate what you actually need when it comes to veggies. And, let’s face it; no one likes to see food go into the waste bin because it goes bad. This is where a kitchen appliance like the FoodSaver comes in handy. You can wash your lettuce and vegetables then seal them in food storage bags until you are ready for them. You can purchase food items in bulk. One trip to Costco or Sam’s Club can save you time and money. You can stock up on pantry items you routinely use so you won’t be running to the store every week for these items. In fact, your purchases could last several months or longer before you need to restock. You can buy your meats in bulk, as well. Again, this is where the FoodSaver becomes your best friend. You can portion out your meat choices and freeze them individually. Then when you need a chicken breast, for example, you take one out to defrost and cook. Now that you’re determined to eat healthy meals, clear out food items you won’t eat and don’t need. Make room in your refrigerator, freezer, and pantry for the foods you will consume based on your meal plan. The next step is to go shopping for the food and ingredients on your list. Some purchases such as produce will be for the short term as they don’t last long. Other purchases such as oils, spices, and canned goods are long-term purchases. You can also purchase enough meats, chicken, pork, etc., for the month. When you stay organized, you’ll see when you’re running low on items and replenish as necessary. Staying organized will make it easier to follow your meal plan. You’re probably exhausted after a long day at work. You don’t have the energy to make even one more decision let alone what to eat for dinner. When you have a meal plan you don’t have to make that decision. It’s easy to stay on track since you’ve already made your healthy choices. In some instances, you may even have a pre-cooked meal waiting for you. These are the times when being organized and planning ahead really pays off. How do we make planning healthy meals painless? Here are a few tips. Don’t just think about what you need for the meals you’re going to eat; you must write everything down. Make a list of all the food and ingredients you plan to eat in a four week period. Use a calendar or planner, or even a food app. This way you’ll know what you need on a weekly basis. This also lets you see the big picture which then allows you to incorporate more variety into your meal plan. Now you go shopping for the food and ingredients on your list. Some purchases such as produce will be for the short term as they don’t last long. Other purchases such as oils, spices, and canned goods are long-term purchases. You can also purchase enough meats, chicken, pork, etc., for the month. As previously mentioned, prepping for your meals is a huge timesaver. It also makes it easier for you to put your meals together quickly. If your lettuce is already cleaned and crisp, you just put it in the container you’re taking to work. Add some tomatoes and whatever other vegetables you want and you have your salad for lunch. Grab some fruit and you’re good to go. Your meal plan should include taking your lunch to work. The lunches you prepare yourself will be healthier than anything you can buy in a restaurant or fast food chain. And another obvious benefit is you will cut down on the cost of eating out. So, not only do you plan meals for dinner, you also plan for breakfast, lunch, and, yes, your snacks. This is how you stick to your plan. You don’t have to think about it every day; you just go with the plan you made at the beginning of the week. When you plan your meals, you also need to plan your budget. Most people don’t have unlimited funds; they need to make a budget for their monthly expenses. That means you need to incorporate your grocery shopping into your budget. If the items you need exceed the amount you can spend you might need to revise your plan. Or if you really like the plan you developed, you could look for coupons and sales to stretch the food budget. There are ways to accommodate your plan and your budget if you make your plan a priority. You may want to consider the season as you plan your healthy meals. You’ll probably want comfort food on those cold winter days, and lighter meals during the summer when it’s hot. Do you really want to turn on the oven when it’s 100 degrees outdoors? So consider the weather when meal planning. If you choose to buy your produce from a local farmers market, you can buy seasonal produce. Locally grown fruits and vegetables are fresher and tastier when they are in season. Yes, in today’s global economy, almost everything is available all year. But locally grown produce is generally better and provides more nutritional value for your buck. And finally, nobody is going to be 100% perfect at following their plan. This is especially true if eating healthy meals routinely is new to you. You may accidentally find yourself picking up your breakfast, lunch or dinner at a drive-thru window. Don’t beat yourself up… it’s not the end of the world. Do your best to succeed and get back on track immediately when you fall off the wagon. Take baby steps if need be. Eliminate the constant cycle of eating processed foods as best you can, one meal at a time, if necessary. This is a good first step; but there’s more to it. Calories, carbohydrates, fats, and proteins consumed all play a part in achieving good health through nutrition. Confusion and frustration invariably leads to disappointment and discouragement. So don’t try to take everything on at once. However, you don’t want to go in blind either. Once you decide on your meals, you can go to the FatSecret website. At the very least you’ll know how many calories you’ll be eating. Or you can go to EatThisMuch and it will help you plan your meals, even make suggestions. In fact, there are many websites online that will help you plan your healthy meals. Just do a search for meal planners. No one says planning healthy meals and sticking to the plan will be easy. But if you’re serious about changing your eating habits you need to do it. Do it until it becomes a habit; your new normal way of life. You’ll soon discover the benefits to your physical health, finances, time, and general quality of life are more than worth it.